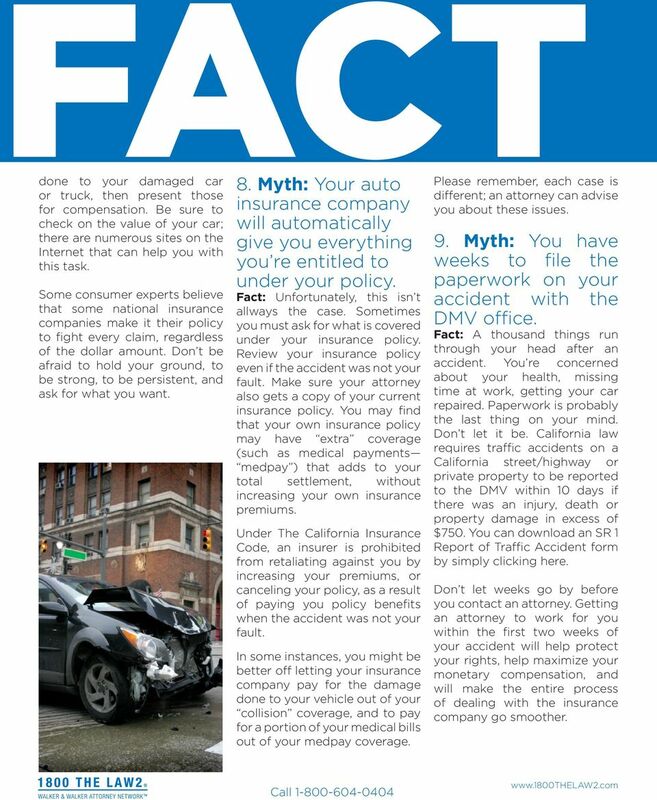 Download "12 Common Auto Accident Myths: Protecting your rights and wallet after being injured in an auto accident." 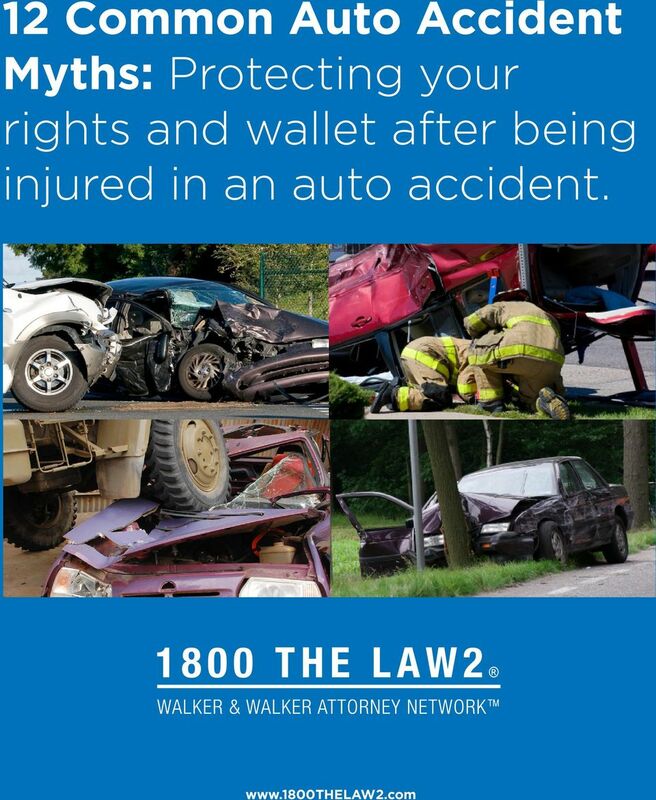 1 12 Common Auto Accident Myths: Protecting your rights and wallet after being injured in an auto accident. 2 Introduction An auto accident can dramatically change your life. You could be injured and/or in pain for a very long time. You must deal with the insurance company. You may miss work. And not least of all, your car needs to be repaired at once. To assist you through this challenging time, here are a few facts that can help protect your legal rights as well as save you time, money, and frustration. This handbook is filled with a lot of important information that can help you, but may not apply to your specific situation and cannot substitute for the legal advice of an expert attorney. Remember: If you re in an auto accident, you have the right to seek legal representation. The experienced attorney members of Walker & Walker Attorney Network at THE-LAW2 are experts in auto accident related issues. Call us day or night, we re open 24/7 to help you. You can also visit us on the Internet by logging on to. There s no obligation. Your initial consultation with an attorney member is free and there are no up-front out-ofpocket fees. Plus, any information you provide to any of the attorney members of THE-LAW2 is strictly confidential. Find out if you have a case. 2 get answers. 2 get results. Call THE-LAW2. Thank you. 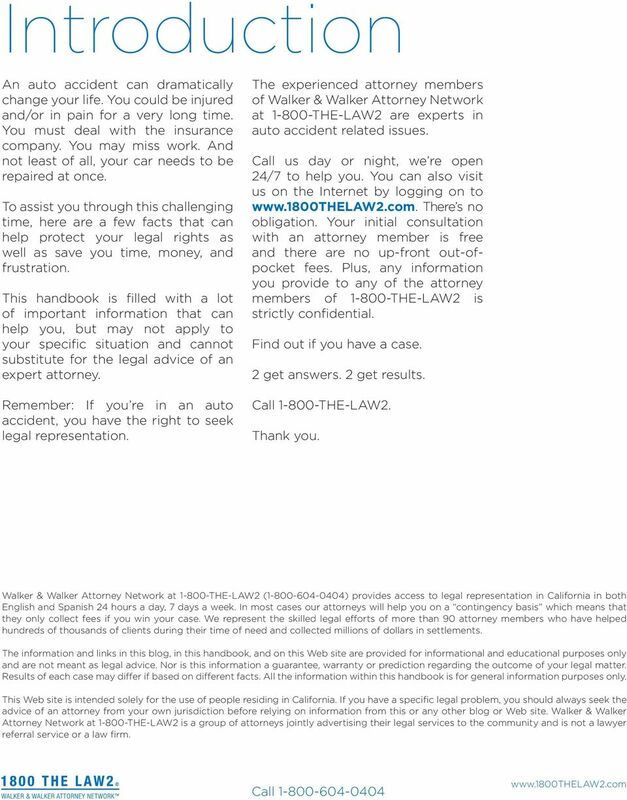 Walker & Walker Attorney Network at THE-LAW2 ( ) provides access to legal representation in California in both English and Spanish 24 hours a day, 7 days a week. In most cases our attorneys will help you on a contingency basis which means that they only collect fees if you win your case. We represent the skilled legal efforts of more than 90 attorney members who have helped hundreds of thousands of clients during their time of need and collected millions of dollars in settlements. The information and links in this blog, in this handbook, and on this Web site are provided for informational and educational purposes only and are not meant as legal advice. Nor is this information a guarantee, warranty or prediction regarding the outcome of your legal matter. Results of each case may differ if based on different facts. All the information within this handbook is for general information purposes only. This Web site is intended solely for the use of people residing in California. If you have a specific legal problem, you should always seek the advice of an attorney from your own jurisdiction before relying on information from this or any other blog or Web site. 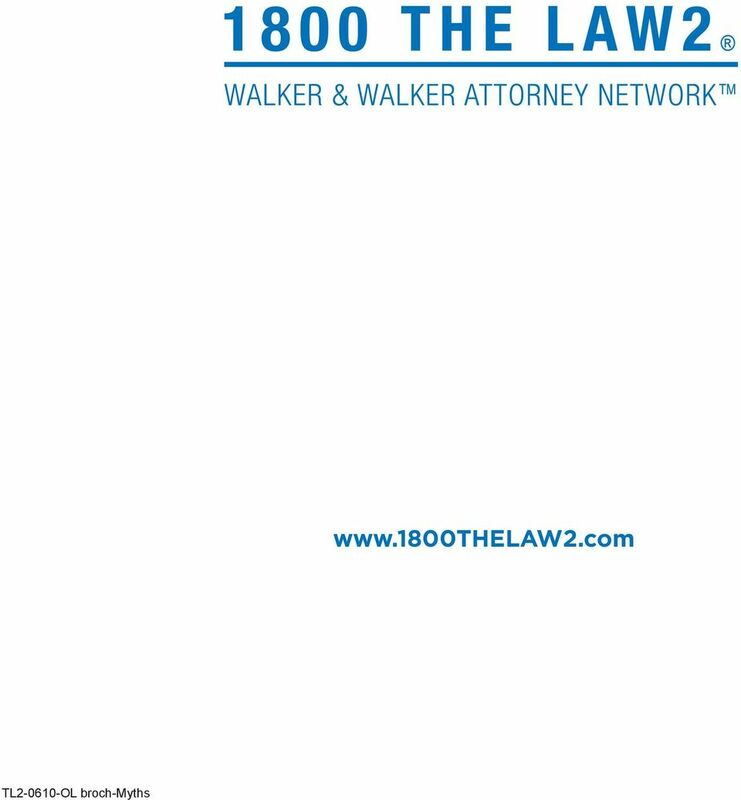 Walker & Walker Attorney Network at THE-LAW2 is a group of attorneys jointly advertising their legal services to the community and is not a lawyer referral service or a law firm. 3 MYTH 1. 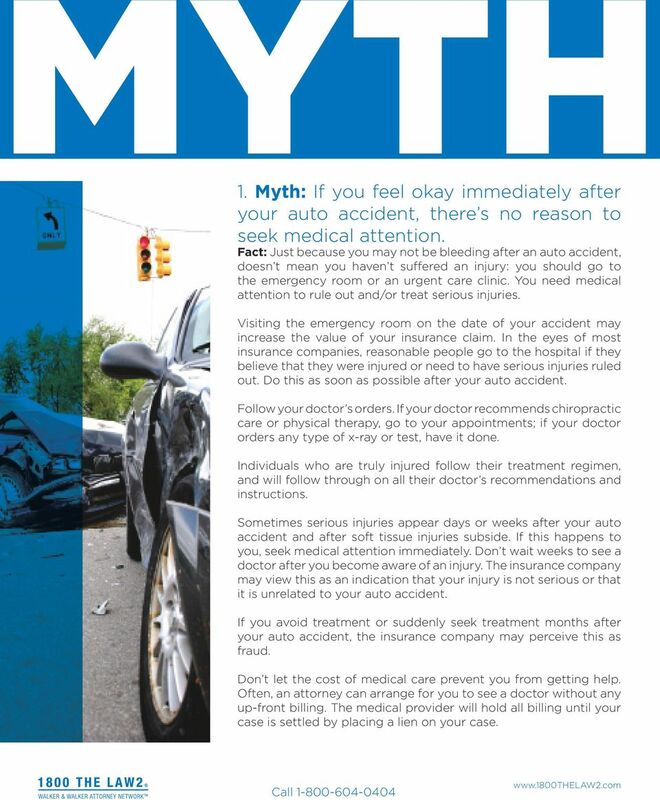 Myth: If you feel okay immediately after your auto accident, there s no reason to seek medical attention. Fact: Just because you may not be bleeding after an auto accident, doesn t mean you haven t suffered an injury: you should go to the emergency room or an urgent care clinic. You need medical attention to rule out and/or treat serious injuries. Visiting the emergency room on the date of your accident may increase the value of your insurance claim. In the eyes of most insurance companies, reasonable people go to the hospital if they believe that they were injured or need to have serious injuries ruled out. Do this as soon as possible after your auto accident. Follow your doctor s orders. If your doctor recommends chiropractic care or physical therapy, go to your appointments; if your doctor orders any type of x-ray or test, have it done. Individuals who are truly injured follow their treatment regimen, and will follow through on all their doctor s recommendations and instructions. Sometimes serious injuries appear days or weeks after your auto accident and after soft tissue injuries subside. If this happens to you, seek medical attention immediately. Don t wait weeks to see a doctor after you become aware of an injury. The insurance company may view this as an indication that your injury is not serious or that it is unrelated to your auto accident. If you avoid treatment or suddenly seek treatment months after your auto accident, the insurance company may perceive this as fraud. Don t let the cost of medical care prevent you from getting help. Often, an attorney can arrange for you to see a doctor without any up-front billing. The medical provider will hold all billing until your case is settled by placing a lien on your case. 4 FACT 2. 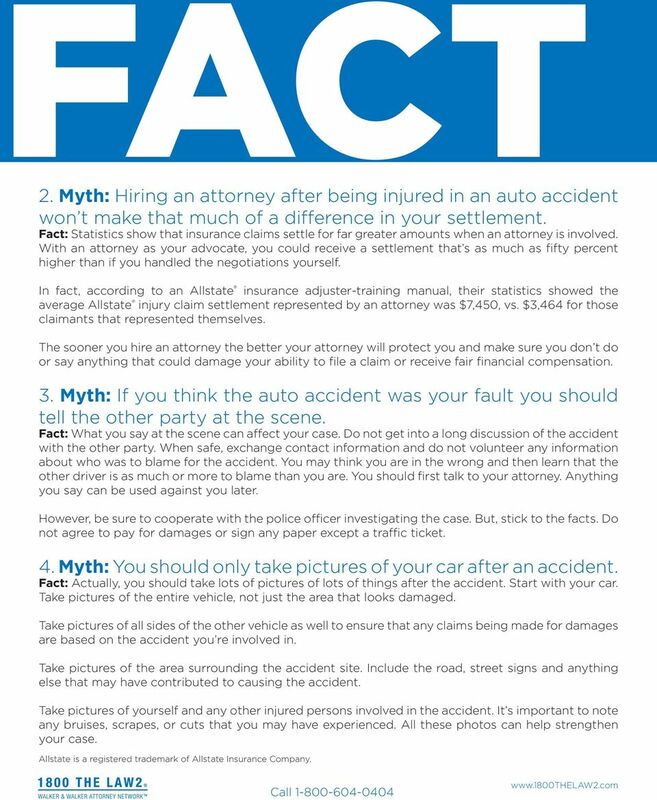 Myth: Hiring an attorney after being injured in an auto accident won t make that much of a difference in your settlement. Fact: Statistics show that insurance claims settle for far greater amounts when an attorney is involved. With an attorney as your advocate, you could receive a settlement that s as much as fifty percent higher than if you handled the negotiations yourself. In fact, according to an Allstate insurance adjuster-training manual, their statistics showed the average Allstate injury claim settlement represented by an attorney was $7,450, vs. $3,464 for those claimants that represented themselves. The sooner you hire an attorney the better your attorney will protect you and make sure you don t do or say anything that could damage your ability to file a claim or receive fair financial compensation. 3. 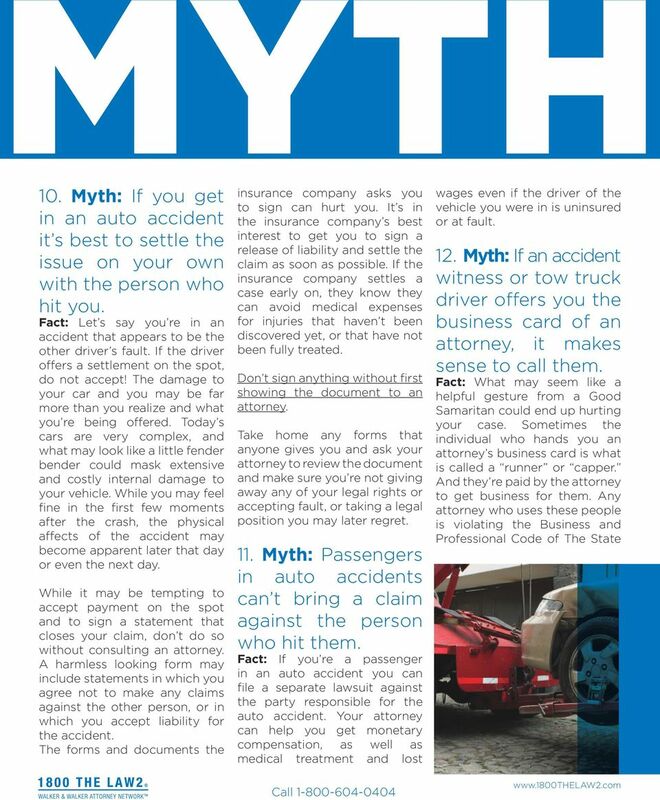 Myth: If you think the auto accident was your fault you should tell the other party at the scene. Fact: What you say at the scene can affect your case. Do not get into a long discussion of the accident with the other party. When safe, exchange contact information and do not volunteer any information about who was to blame for the accident. You may think you are in the wrong and then learn that the other driver is as much or more to blame than you are. You should first talk to your attorney. Anything you say can be used against you later. However, be sure to cooperate with the police officer investigating the case. But, stick to the facts. Do not agree to pay for damages or sign any paper except a traffic ticket. 4. Myth: You should only take pictures of your car after an accident. Fact: Actually, you should take lots of pictures of lots of things after the accident. Start with your car. Take pictures of the entire vehicle, not just the area that looks damaged. Take pictures of all sides of the other vehicle as well to ensure that any claims being made for damages are based on the accident you re involved in. Take pictures of the area surrounding the accident site. Include the road, street signs and anything else that may have contributed to causing the accident. Take pictures of yourself and any other injured persons involved in the accident. It s important to note any bruises, scrapes, or cuts that you may have experienced. All these photos can help strengthen your case. Allstate is a registered trademark of Allstate Insurance Company. 6 FACT done to your damaged car or truck, then present those for compensation. Be sure to check on the value of your car; there are numerous sites on the Internet that can help you with this task. Some consumer experts believe that some national insurance companies make it their policy to fight every claim, regardless of the dollar amount. Don t be afraid to hold your ground, to be strong, to be persistent, and ask for what you want. 8. 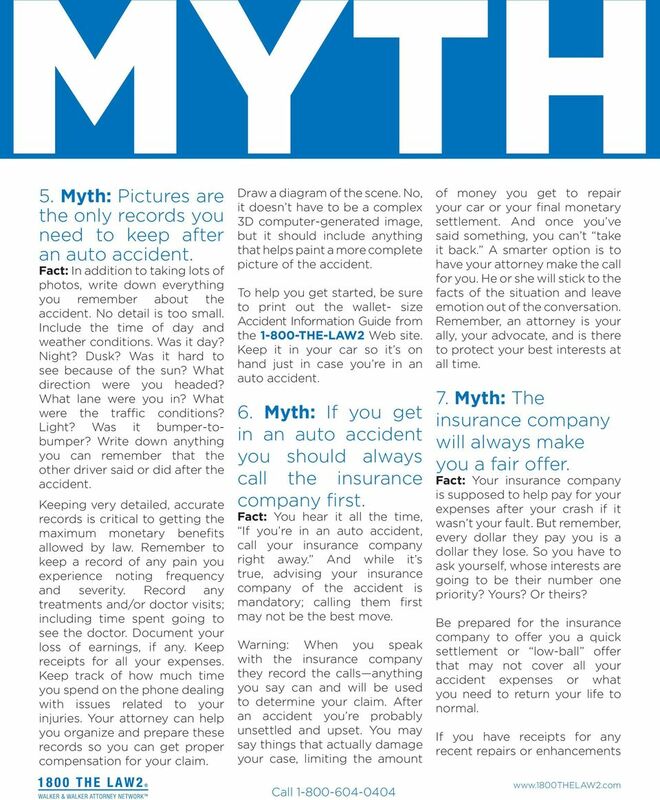 Myth: Your auto insurance company will automatically give you everything you re entitled to under your policy. Fact: Unfortunately, this isn t allways the case. Sometimes you must ask for what is covered under your insurance policy. Review your insurance policy even if the accident was not your fault. Make sure your attorney also gets a copy of your current insurance policy. You may find that your own insurance policy may have extra coverage (such as medical payments medpay ) that adds to your total settlement, without increasing your own insurance premiums. Under The California Insurance Code, an insurer is prohibited from retaliating against you by increasing your premiums, or canceling your policy, as a result of paying you policy benefits when the accident was not your fault. In some instances, you might be better off letting your insurance company pay for the damage done to your vehicle out of your collision coverage, and to pay for a portion of your medical bills out of your medpay coverage. Please remember, each case is different; an attorney can advise you about these issues. 9. Myth: You have weeks to file the paperwork on your accident with the DMV office. Fact: A thousand things run through your head after an accident. You re concerned about your health, missing time at work, getting your car repaired. Paperwork is probably the last thing on your mind. Don t let it be. 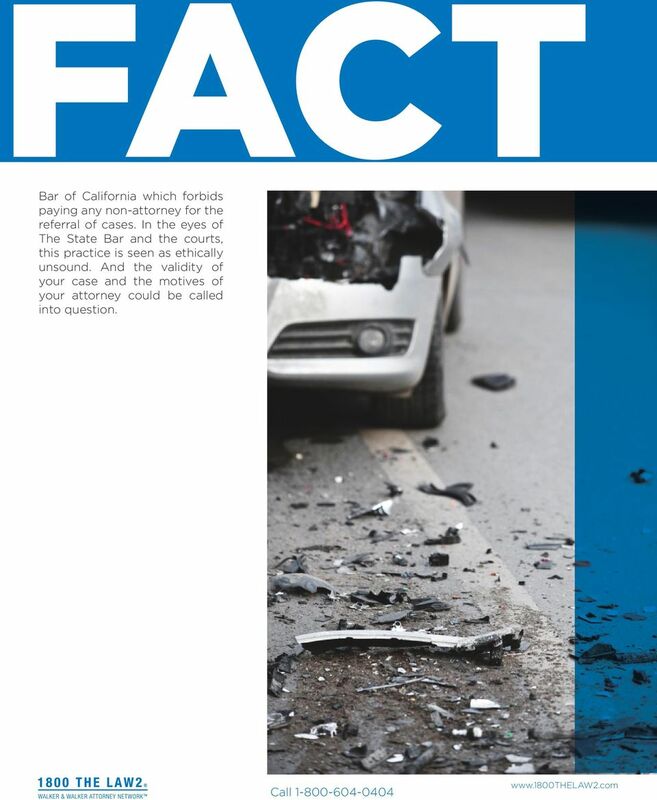 California law requires traffic accidents on a California street/highway or private property to be reported to the DMV within 10 days if there was an injury, death or property damage in excess of $750. You can download an SR 1 Report of Traffic Accident form by simply clicking here. Don t let weeks go by before you contact an attorney. Getting an attorney to work for you within the first two weeks of your accident will help protect your rights, help maximize your monetary compensation, and will make the entire process of dealing with the insurance company go smoother. 8 FACT Bar of California which forbids paying any non-attorney for the referral of cases. In the eyes of The State Bar and the courts, this practice is seen as ethically unsound. And the validity of your case and the motives of your attorney could be called into question.